.. ".,- .rWASHIMNGTONl C "
- . '* ,' .- : .' : ,. ',. ',jiv a. Acreag'.e of cotton in ultiv'tion on July 1. * . ;,.-._ ,?.( . *: J. '.., i. ... .. ; .. .
.-. *.4".." '... "* -" fertilizer for all purposes in cotton States. "a. ,. '-; "i. ."' ; -. : "; '. '-" "
*.. ... dicated production . '. "..-... 1, probable prodtitction. .-, -;. -. dtctlo bf' citr ruits.' (1953 q53 crop). ~.... ,. .,. .'".... .... ,. : ." .. ." ." 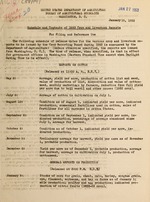 ': "
duction; indicated production of citrus fruits (1952-53 crop). and sugar beets; acreage of hay for harvest. value of production of tobacco (by types and classes). production; grain fed per milk cow;. poultry and egg production. of cane ground for sugar. estimates of the 1952 peanut crop. grain fed per milk cow; poultry and eggproduction. fed per milk cow; poultry and egg production. acreage and condition of rye for harvest in 1954. 3:00 P.M., January 23, April 24, July 24, and October 23. January 23, April 24, July 24, and October 23. July 29, and October 29. July 24, Aug. 24, Sept. 24, Oct. 23, Nov. 24, Ded. 23. Potato Stocks8 3100 P.M., January 19. Onion Stocks: (Jan. 1): 3:00 P.M., January 19. Cabbage Stocks| (Jan. 1): January 9,. Hop Stocks: Karch 23, tj and September-23, L/. July 10;| August 11; September 10; October 9; November 10; December 10 and 17.
and 23; July 10 and 22; August 11; September 10; October 9; November 10; December 17. FrAits Non Citrus Production and Utilization: July 1. Cranberries: Indicated production, 1;00 P.M., August 18.
kinds of vegetable seeds 1j/. movement, quality, stocks and disposition of important field seeds. Fruit and Nut Crops: January 14. Principal Yield and Seed Cronps (except cotton, tobacco, and sugar) May 5. Cotton and .Cottonseed: Cotton report May 8. Tobacco: Vith General Crop report May 11. Surgar Beets and Sugar Cane: With General" Crop report June 10. January 13: Cattle on Feed for Market on January 1. "-. : .' "* : <-:.t^. ] i. *..
i4arch 10: Early Lamb Crop as of k'arch 1 (10 States). &nril 14: Cattle on Feed for market, Corn Belt States, as of April 1. April 14: Cattle on Feed Illinois, Iowa, Nebraska -April 1 'J/. &pril 29: 'Farm Production and Income from Meat Animals, 1952. -Jay 12.:- Development of Early Lamb Crop, as of thaj 1. July 30: U.S. Lamb Crop; 1953. Number and Percentage of Breeding Ewes. August 6: Production of Shorn Wool, 1953. November 10: Cattle Feeding Situation as of November 1.
i4ovember 12: Iamb Feeding Situation as of November 1. February 27, lularch 31l April 30, Nay 29, June 30, July 31, August 31, September 30. June 131 Shipments of Cattle into-Ilint Hills and Osage Pastures as of June. Intended Purbchases of Baby Chicks -Issued with Crop Production Report, February 10. Composition of Farm Flocks October 1, issued with Crop Production Report October 9. Monthly Eeg Production. 1951 and 1952: February 27. Youne Chickens and Potential Layers on-Farms in 1951 and 1952: March 13. OhiAkens a ded on Farms, nreliminar estimates. 1953- July 31. Farm Production and Income from Chickens and Eazs. 1952: April 6.
uarhke ProdutAiin Indicated by.reported.intentiond: as of January 1: January 23.
farm Production and Income from Turkeys. 1952 Neireh ;7. )n farms 'for preceding tonth,. U.S. 'and seleotpd -States, issued withi' lontkU. -.. .** .. .. .. *..[::. ]2.=2 = :. ".. .. "
Milk Production on farms and Statistics of Dairy Plant Products. 1953aZ lebruaw lb. Chicago, Ill., 805 New Post Office Bldg.) . 25th of each month. _/ (Released at Chicago, Ill., 805 New Post Otfice id1 . Milk Prices Paid at Creameries and Cheese Plants, by States about .29th of.:. Fluid Milk and Cream Report: Jan. 16, Feb. 17, IMar. 17,. Apr54l 16 1y .Wy . June 17, July 16, Aug. 18, Sept. 16, Oct. 16, Nov. 17, Dec. 16.
iraDorated and Condensed Milk. Wholesale Grocers' Stocks: January 21, April 21. PrelimiAnary Manufactured Dairy Products Revort. 1952: September 1953. &Inal ikapufacturedDairy Products Report 1952: December 1953.
of colonies and average pounds of winter stores in hives. June 30, July 31p August 28, September 30, October 30, November 30, and December 30. November 10, and December 10. Production of Meat Scraps and Tankage: February 5, August 4.